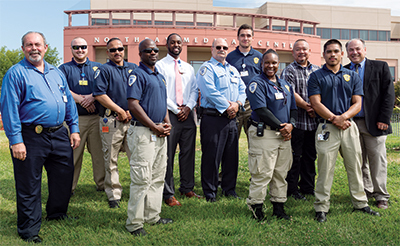 The security team at NorthBay Medical Center and NorthBay VacaValley Hospital has grown to 65-plus and works round-the-clock, 24/7/365. When a verbal altercation between two groups of visitors erupted into a fistfight in the parking lot of NorthBay Medical Center, it only took moments for NorthBay Healthcare’s security team to step up and deftly diffuse the situation, dispersing the crowd, restoring calm. It was all over in minutes and no one was hurt. “They did everything they were supposed to do, and they did it beautifully,” says Rich Cinfio, NorthBay’s chief security officer. as being able to handle physical confrontations. Violence in hospitals across the nation has been on the rise for the past several years, notes Rich. Healthcare providers continue to grapple with how best to identify early indicators of violence to enhance prevention, and what response strategies are most effective. At the same time, it’s no secret that Fairfield has had its share of challenges in the past few decades, with crime, drugs and gang activity. Just a few years ago NorthBay Healthcare contracted with a security-for-hire company, but a survey made it clear that staff wanted more. Enter Rich Cinfio, a longtime lawman, who was hired as NorthBay’s security program director. After an assessment, he proposed a sea change: that NorthBay hire and train its own security force. Within a year, 43 part-time and full-time security officers, supervisors and plainclothes officers were on the team. By the end of this year, more than 60 will pledge allegiance to the NorthBay force. “It gives us more control on training and consistency,” says Rich. Rich, who retired as captain of the San Carlos Police Department after three decades, spent a year and a half on the security team at Stanford University, where he learned Human Behaviorial Threat Assessment—skills that he uses to this day. As a result, NorthBay’s security staff is trained to handle not only physical confrontations but practice conflict resolution. Rich, an FBI National Academy and West Point Leadership Program graduate, has not only trained his security team, but also makes training available to every employee, and writes an occasional blog about best safety practices and security measures.